I’ve been playing around with this knife for several weeks now. I have to say, if you’re in the market for a sturdy, no nonsense bushcraft blade at a relatively inexpensive price, you can’t do much better than the Condor Bushlore. Made from 1075 high carbon steel, the blade arrived shaving sharp and holds the edge quite well. It has an aggressive grind, giving ample room forcarving despite the blade’s thickness of 1/8″. The blade runs 4 5/16″ in length. This is a great size for handling most common chores around camp as well as at home. Not so long it is unwieldy, but enough blade to do the job. The shape of the blade is also excellent, with a bit of a belly to it as it approaches the tip. This makes it excellent for skinning game as well as for completing any number of typical camp chores. The handle consists of hardwood scales that are riveted to the full tang. You’ll notice there is a bit of a bulge in the handle as well. While it looks rather bulky, the handle is actually quite comfortable to hold. Personally, I like a knife that has a contoured handle as it helps to prevent fingers from accidentally sliding up to the blade. One drawback, though, is that because the scales are riveted on, replacing them would be rather difficult. But, again, the handle is very pleasing to the hand and given that the scales are made from walnut, they’ll hold up to a ton of abuse. With some knives I’ve owned over the years, the sheath has been the weak point. Either it is poorly constructed of substandard materials or it is just a pain in the arse to use for one reason or another. The sheath that comes with the Condor Bushlore is crafted from thick leather. 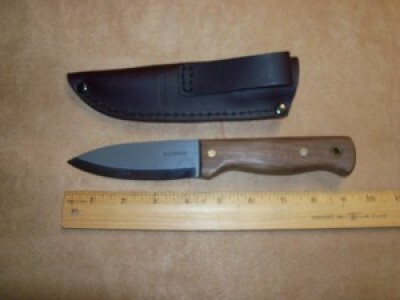 There is no strap or snap retaining the handle, the knife just fits very snug in the pouch of the sheath. The belt loop is very wide, allowing you to use just about any belt you may have. When the knife first arrived, it took a bit of work to get the knife in and out of the sheath due to the tight fit. But, after a while it loosened up just enough to make drawing and replacing the knife very smooth. At the same time, there is still enough tightness to retain the knife while moving around. Like the knife, the sheath is nothing fancy, really. No separate pockets or pouches. But, again like the knife, it is made to work, not just look pretty. It has a job to do and it does that job very well! The Condor Bushlore is semi-handcrafted. As a result, there may be slight cosmetic differences in scales, blade finish, and such. However, it is also very moderately priced at around $50.00. You can find it on Amazon here. The price is important to me (and probably you as well) because often times we’ll drop a considerable amount of coin on a blade, then be afraid to actually use the damn thing because it was so expensive. That’s certainly not the case here. As soon as it arrives in your mailbox, you’ll be searching for projects and jobs where you can put it to use. Upon seeing the knife, several people have commented that it looks very similar to a basic kitchen knife and that’s a fair comparison. No one will ever mistake a Condor Bushlore for a high-end display blade. But, that’s not the point of owning one, either. This is a knife that is designed for use and abuse. It is meant to be in your hand, working in the field, not sitting on a desk or mantle. It is a working knife, not a showpiece. I’ve carved with it, used it to baton firewood, and performed several other basic chores. It hasn’t let me down even once. It has held an edge and has also been easy to sharpen as needed. The sheath is extremely durable and has shown no signs of wear. In reading other reviews, some people have lamented that their knife didn’t arrive hair-popping sharp. I don’t know what to say about that other than mine certainly did. But, as with any knife purchase, you should be prepared to fine tune the edge. To me, that’s just common sense. 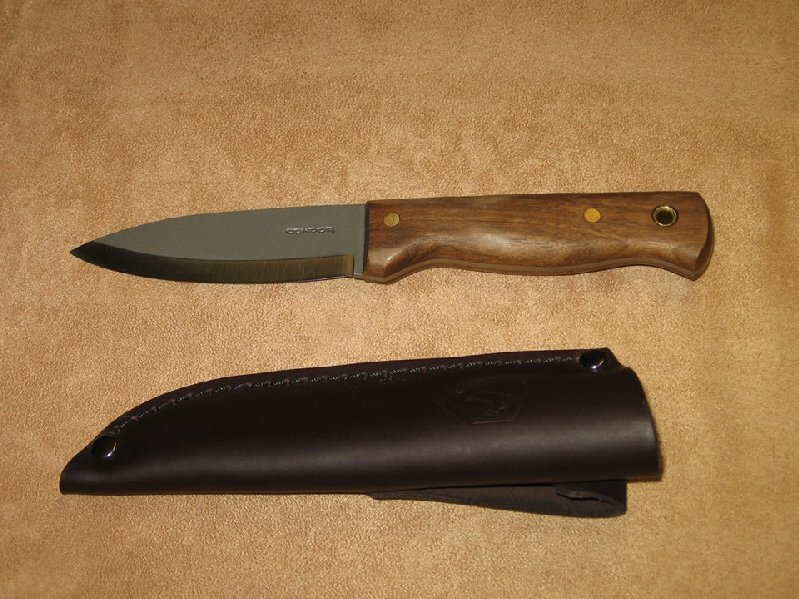 The Condor Bushlore knife would be an excellent addition to any bug out bag or other survival kit. It is a high quality knife at a discount price, that’s for sure.